OMAHA, Neb. – Watch live streaming coverage of the 2018 College World Series championship match between No. 3 Oregon State and No. 5 Arkansas at TD Ameritrade Park here in Omaha. ESPN will provide the live television broadcast, with the first pitch initially scheduled for 7:00 pm ET. The ESPN family of networks, including ESPN3 and the Watch ESPN app, will also have live stream of the game for those who have subscription access. The start of the game has been pushed back due to rain delay here in Omaha. Heavy lightning in the area forced fans and officials to take cover, with the supporters told to leave their seats and moved to the concourse. 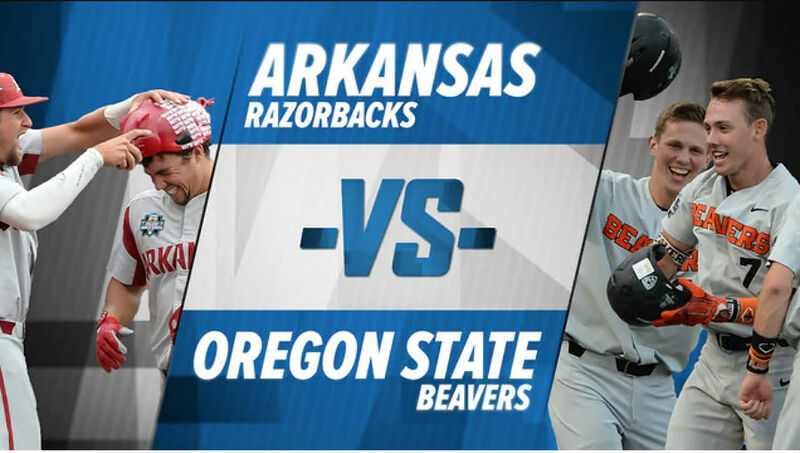 After battling through an intense double elimination part of the 2018 College World Series, Oregon State and Arkansas will now square off in the first game of a best-of-three series for the 2018 national title. Oregon State and Arkansas have battled on three previous occasions, but the last time these two sides met was in 1995 in San Jose, Calif. The Razorbacks won that clash 5-4, and lead the overall series 2-1. Both the teams also met at the 1986 Midwest Regional in Stillwater, Okla., with Arkansas winning the first game, 4-3, and the Beavers taking the second, 1-0. Arkansas had an impressive ride into the College World Series championship, after sweeping through their bracket and knocking off No. 1 seed and defending national champion Florida in the semifinal. Oregon State, meanwhile, needed to get past Mississippi State twice to earn its trip.